First it was a whirring drone that seemed to circle from above. Then, there were a series of explosions, each one louder than the last. Finally, there were great cracks —the ripping of splintering wood— accented with a loud thump and the flurry of birds forced into flight. Sylvia Yanez was dressed in a pink tank top and dusty jeans, wearing a red bandana around her head, as she looked down at her oil-stained sandals. Standing beside her mother, Maria Garfolo, Sylvia carried a small bag filled with clothes over her right shoulder. Together, they waited for the familiar sound of a diesel engine tooting along the dirt road. With people wedged in every conceivable space —some seated on the roof— the white and green bus was really a converted field truck. It had large wheels with aggressive treads, and often looked stained with soot. This loud, cramped vehicle was one of the few options for travel from their village of San Carlos, in the canopied shade of the Ecuadorean rain forest, with the capital city, Quito. Young women like Sylvia Yanez often traveled to the city for entertainment, school, or employment. Sylvia was going for treatment for a tumor doctors had found in her liver. As mother and daughter climbed aboard the sputtering truck, securing seats —with some difficulty— as the exhaust pipes puffed acrid smoke into the air, they drove past four large, jet-black tanks behind a warped chain link fence. From all directions, thousands of feet of tangled, rusted and chipped tubes drew pure crude oil from the sweltering jungle. The forces of nature alone once molded Ecuador. Imbued with melted glacial waters, the Amazon River pulled the most diverse ecosystem down from the snow-capped mountains to the lush and humid river basin, leaving the gnarled trees of the high altitude “cloud forest” stranded on the South American Andes. The result was three distinct topographies: the Costa (or coast), the Sierra (or mountain range), and the Oriente (or river basin). In the Oriente, most days are hot and moist, and the ground primarily shrouded by a cathedral of trees. Like the Capirona, a tree that can grow to 100 feet, the jungle’s tallest flora spread their roots widely to brace themselves against the thin, highly acidic soil. For support, the trees wind their roots around an arboreal neighbor as colorful plants called epiphytes attach themselves to the trunks —they living off the moist air and fertile detritus of the forest. Under the canopy’s large, smooth, green leaves, amid the chirped calls of the shock-blue breasted tanager, orange-billed toucan and stout but noisy kingfisher, and along the shore of the Arguarico River live the indigenous populations of northeast Ecuador. The Siona, Secoya, Cofan and Quichua peoples have maintained a spiritual connection to this biotic paradise. They track and hunt the forest’s wildlife, collect its wild herbs and plant roots, and use the fertile soil to grow food. But the jungle environment is ruthless and, as home to nearly half of the world’s species, the Amazon has always privileged the strongest at the cost of the weak. That is until mankind’s meddling tipped the balance. Emergildo Criollo heard them coming. As a child from the Cofan tribe, Emerglido often awoke to unknown and frightening noises around his village. First it was a whirring drone that seemed to circle from above. Then, there were a series of explosions, each one louder than the last. Finally, there were great cracks —the ripping of splintering wood— accented with a loud thump and the flurry of birds forced into flight. Unknown to Emerglido, the whirring came from circling helicopters filled with Texaco prospectors scouting potential drill locations. The explosions were the result of company geologists measuring sound waves from underground detonations: the process allowed them to better pinpoint the location of the crude oil. And the splintering cracks were the result of felled trees necessary to make trails, roads and heliports for these remote drilling sites. But while Emerglido may have been ignorant of the means of oil extraction, he clearly recognized the consequences. Six months after Texaco began drilling in the Lago Agrio region near Emerglido’s village, he saw an opalescent gleam on the surface the Aguarico River. Within days, that gleam turned to a thick, oil-rich mud. It obstructed the water flow, damaged surrounding plants, and killed animals that grazed the river’s edge. That was 1972. Extracting crude oil was a dangerous process even with the best equipment. In short, oil was pumped out of the ground with anadditional chemical solvent, called formation water. This water, also known as toxic brine, would retain heavy metals like arsenic, cadmium, lead and mercury. 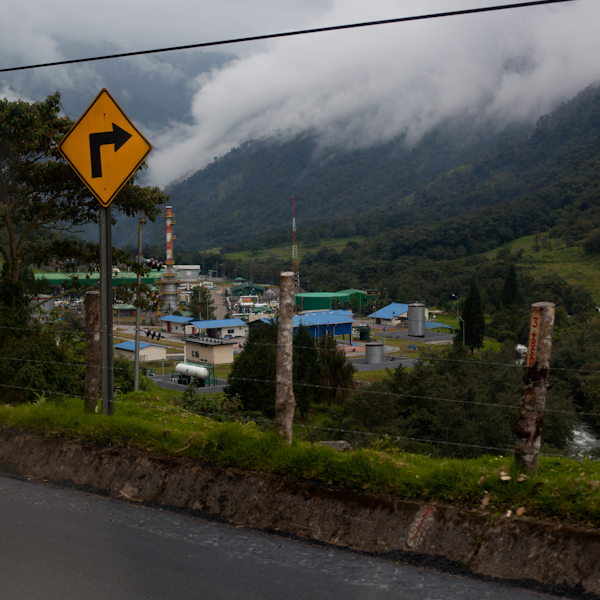 While these substances were often burned for disposal, few controls existed in Ecuadorian oil facilities to guard against heavy metal pollution. These highly poisonous substances were leeched into the vulnerable ecosystem. At issue were nearly a thousand unregulated oil retention pits, dug in the area surrounding major drilling sites. According to environmental regulations, these pits were supposed to be lined to protect seepage, and were intended as temporary storage for oil. Texaco failed to line more than 900 of these pits, and then used them as permanent storage locations. According to company documents, these violations were knowingly committed. With time to mull in these rudimentary pits, hazardous petroleum hydrocarbons —resilient and toxic compounds—seeped into the water table and created a deadly poison cascade. By the early 1990s, oil production had grown from 70 to 300 thousand barrels each day, and the effects had become evident. Cancer rates in the surrounding villages were two to three times higher than average, livestock and domesticated animals would often die after drinking river water and cattle used for food and milk suffered miscarriages due to the land’s toxicity. Some cattle simply stopped eating and died, their stomachs often eaten away by the now-corrosive grass they’d grazed on. Traditional crops like rice were stunted and often discolored. The summer’s dry winds would kick up poison particles, which were then inhaled by villagers. The young and old complained of severe respiratory issues, and villagers recorded troubling skin lesions, rashes, and persistent sores. In an attempt to quell the growing tensions, Texaco began collaborating with missionaries, working to pacify populations through the promise of modern religion and development. But the roads built by Texaco opened the region to exploitation from land speculators, ranchers, loggers, colonists, agro-industrialists, and the Ecuadorian military. By the time Texaco halted operations in 1992, the company had recorded at least 30 major oil spills, dumping 16.8 million gallons of toxic oil into the Amazon –six million more than the Exxon Valdez tanker leaked into Alaskan waters. To remedy the negligent, reckless, intentional and outrageous acts and omissions of defendant Texaco Inc. in connection with its oil exploration and drilling operations which have cause plaintiffs and the class to suffer property damage, personal injuries, increased risks of cancer and other diseases, and has resulted in the degradation and destruction of the environment in which plaintiffs and their families live. The legal battle was torturous. Continued delays and costly hearings about where the case should be tried led to stalling tactics by Texaco. By 2001, Texaco was purchased by another American petrochemical giant, Chevron. Backed by high-powered lawyers with company checkbooks at the ready, Chevron continued the war against the class-action suit. By 2008, an Independent assessment conducted by a judge in Ecuador found that Chevron should pay $27 billion in damages for environmental remediation, cancer deaths, impacts on indigenous culture, and Texaco’s unjust enrichment from its operations. The report, immediately opposed by Chevron’s Washington-based lawyers, was non-binding in Ecuadorean —much less United States— courts. Chevron refused to pay. Exhausted from the trip, which took them from their small village of San Carlos, Sylvia Yanez and her mother, Maria Gafaldo arrived in Quito. For most of the trip, they’d slept, entangled on the small, worn seats of the public bus. Now, at the Cancer Center, Sylvia sat with puffy eyes as the doctor took two vials of blood. With her mother rubbing her back, she waited for the results and for her next round of treatment. The visits, every 20 days, cost the family nearly 500 U.S. dollars, a price so exorbitant that Sylvia continued to work in the oil fields that had made her sick while the family sacrificed essentials each month to make the treatments possible. Having seen little of the wealth that was sucked from under their feet, Maria struggled to remedy the ill created by a faceless organization. When her daughter was first diagnosed with cancer, Maria purchased a collection of chickens, hoping that selling the eggs might raise money for the medical treatments.